Our Mission Statement: Do the right thing, Be the best you can. And always show people that you care. Swimming Pool Builders - Sydney's Most Awarded Pool Construction Company! When you need a new swimming pool for your Sydney backyard, talk to Award Pools Group. You can rely on our pool building experience as we have constructed over 2,000 Sydney residential pools in the last 30 years. View our Gallery to see the latest inground pool designs, pool renovations, spas, indoor pools and water features. Award Pools Group operates under a full building licence, so we can also take care of your landscaping and pool building structures such as cabanas and outdoor kitchens. With over 200 accolades to our name, we are Award by name and Award by nature, winning 'Concrete Pool Builder of the Year' at the prestigious SPASA Sydney awards ceremony for the last five years as well as National Pool Builder of the Year for 2018. Award Pools Group's philosophy has always been to provide 'Quality Service and Integrity' in pool design and construction. With 90% of our business coming from word of mouth referrals, our expertise is only as good as a customer says it is. And our feedback shows that we are winning: not just awards, but the hearts and minds of our satisfied customers. 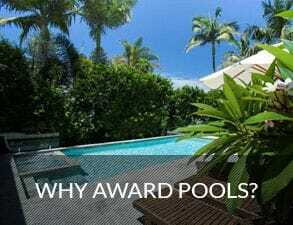 You won't find inground pool builders in Sydney who care more about customer service and attention to detail than Award Pools Group so please get in touch today with our friendly team.